Having accomplished the tsunami wave riding disruption of higher education, Coursera is not resting on their laurels or profit line. No, the crushing of the archaic system is more than imminent, it’s cruising at 35,000 feet. In December 2015 the Learning Really Begins. At 30,000 feet, online higher education isn’t the most effective thing on this plane. Sit back. Relax. Enjoy the lecture video. Tuition ain’t what you gotta worry about. Do not get on a JetBlue fight and think you will not learn something! UPDATE: Nov 27, 2014 Where is my ds106 ethos? 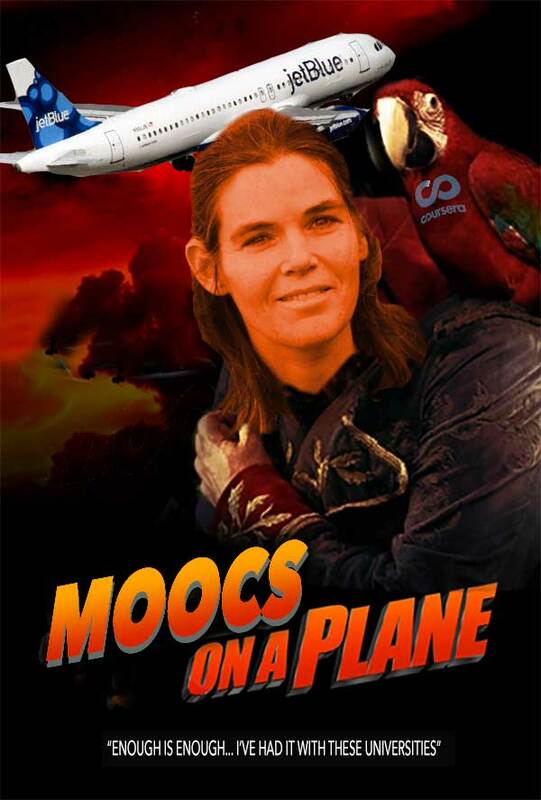 I completely neglected to tag this post to connect it to The Horror of MOOCs assignment. Recently read an abstract for a paper presented at the Santa Fe Institute on how modern airplanes are so complex that some automatic things might need to be returned to human control. Adding “smart passengers” to the planes cognitive burden could seriously overload the system with delusional experts full of interesting concepts but unable to relate those concepts to useful things like doing up their seat belt. According to my echo cardiogram technician, the dynamics of these technically overloaded machines could draw doctors away from medicine into the new field of avionics diagnostics relieving their patients of having to go to university learn medical words that actually relate to obscure golfing strategies. You need to explain again what you have against Coursera MoocS? And I love the idea of learning while I fly–why is that spoofworrhy? And I love your funny poster! MOOCs are like cows. They fart a lot and look goofy. I just do this because its fun and is a reaction to the hyper that they are some sort of magic bullet to Change Education. I do not discount that people may have good learning experiences despite their usual wretched lecture-focused design. Sandy, know your question was directed to Alan but I’ll jump in. MOOCs I think represent a desire for learning that should be taken seriously but not in the commercialized world of reducing knowing to a false simplicities that must be real because any fool can understand them. My experience with the xMOOC presentation carries a proposition of an acceptance rather than an understanding. The world is either agreeably comprehensible or we don’t get-it, and neither outcome really matters. I have been following the MOOCysteria for some time now and finally decided to take a Coursera class in digital storytelling from Coursera myself–you’ll see my review later in December on the NMC website, but it was taught clearly and beautifully via video and well organized resources. Out of thousands who registered, 684 people successfully completed it and posted a personal documentary digital story. Them’s impressive numbers! I increased my skill set especially in audio editing and created a video for the class that got selected and posted on a National Park website. All this was somehow without charge; the class was free, and I made something I could offer up on the internet for free, too. All good things. I understand one example is hardly representative of all of MOOC dom, but at this point, I am finding it hard to be critical of these efforts at education innovation since SOMETHING drastic needs to be done. That doesn’t mean I don’t enjoy the antics of the King’s Fool as he races around poking at any balloon that will make a satisfying pop! when pricked and poked–if it’s ripe for satire, have at it! Glad to hear you had a positive experience Sandy. I admit to being a Connectivist MOOC snob and conduct a great deal of my life in discussion utilities like this comment area. Maybe it’s my short attention span or age/experience that makes me impatient with the xMOOC offerings. As you say, success in one try-out may be a limited indicator but also might be saying you are better at choosing and committing and we certainly have to keep in mind the positive experiences. This is especially important in open and free courses where drifting away is so easy. A question I would have relates to adding some sort of personal touch for those students on the edge of losing interest. The xMOOC model presumes commitment and command of self that many participants are simply not used to. They need peer support but not know how they themselves can ask for or build it. Big jump to make in education? Agreed and certainly needed. I’ll say that the MOOC team who designed the Digital Storytelling class built in peer review at three points in a five week class and had lively, well attended forums on a variety of topics which the team moderated with a light hand. I met and exchanged conversation with teachers all over the world. My own students can drift away regardless of my efforts in either face to face or online classes; each person has their own drama, and I long ago stopped worrying about the fates of either the individuals or the masses. You mentioned short attention span; how do you see that relating to the MOOC idea or experience? Mine is actually very long and sustained, so while of interest, that point eludes me. You mentioned your age; what would that be? How do you see age as a factor one way or the other? I am 64, so this issue is also interesting to think about. My observation is that “kids” usually have problems with attention span, commitment, and “command of self,” but they often grow up to be highly focused, well-organized adults, so I trust that wherever they wander, whether into a connected course, a MOOC, a cult, a seminary or their local community college, mostly they will find their way. I would not argue that you can and have had very positive experiences in MOOCs. I have had rather dismal ones. Which of our experiences do we feel generalizing to all MOOCs? we could say the same of movies, restaurants, art classes. It’s not the MOOC itself that makes this experiences, its the interplay of that with what the instructors bring to the table and what the learners do. But I still doubt the viability of the way many MOOCs are carried out (rigid content, video lecture, limited interaction) as ones that can across the board provide the experience in your Digital Storytelling class. I’d suggest your class succeeded despite the MOOC structure, not because of it. I wear my cow poop colored glasses. Agree Alan that with the variety of MOOCs out there chances are very great that some will be awful and some wonderful. To me some seem carelessly following the presumption that what happens in schools is the only model of education. Never mind drop outs hidden by passing policies designed to make it look like learning is happening. Or just that the model we’ve worked with functions well enough to get people smart enough to remember to breath. Sandy, my most recent two experiences with MOOCs were not satisfactory. One seemed unattended by the facilitator and the second felt as if it was running without real students, just respond-o-bots programed to mimic activity. Living in a small, isolated town I thrive on feedback from “outside” and have developed an ear for not being heard–or maybe a need TO be heard? Engagement is important and may reflect my early conviction that school seemed to have started thousands of years ago, runs uninterrupted and you stepped into and out of it without being noticed. As a life-long-learner it may be my nature to sort of “camp out” in various disciplines and interests. Don’t seem to have an interest in enacting the role or identity of a this or a that expert in a field though I do take pride in the trades I’ve practiced. Hard to describe an attention span as consisting of curiosity for all things that may somehow connect. We are pushed to be focused and “good-at” a few things and I accept that except many exhibits of good-at are so narrow or incomplete. (I know lots of people who enact the core tasks of their their roles while being absent of self. Zombies maybe?). Do you think “short” might be the wrong word for an active attention that won’t settle? I agree that kids wander and most need to in order to discover where they belong. What bothers me is adults who settle into an achieved state and then just rot there. I have a batch of about 10 doctors to choose from at our local clinic to treat my chronic illnesses. Nine of them dress and speak like doctors but have no skills for keeping me alive. They don’t even seem to try. Maybe the dead-patient-avoidance-protocol was omitted from their training? Maybe part of their brain is missing? Maybe at 65 I’m no longer worth the trouble? I don’t really think any of those faults apply. Rather I believe they are content with a low-level of personal performance, so I avoid them. For that type of person, MOOCs would be a waste of time. They seek nothing beyond their own self-regard and contentment with their uselessness.